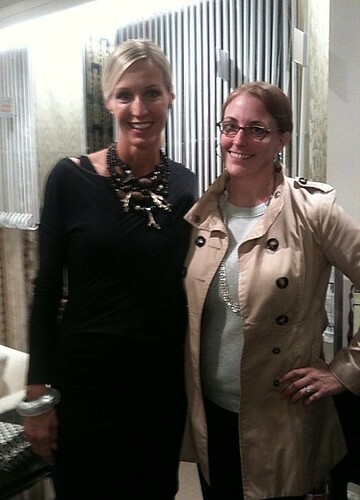 Last week the incredibly talented (and very welcoming) designer Candice Olson came to the Boston Design Center to speak at "Design Boston". Not only was it an inspiring talk but her words confirmed the way I have been designing for the last 7 years at Jace Interiors! A neutral space does not have to result in a boring space. 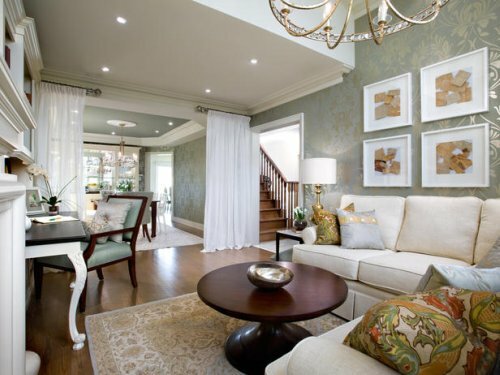 As you can see above by mixing textures and contrasting patterns you create great interest! Just look at the wallpaper against the sharp white panels and frames, it looks stunning! Candice emphasized that a smaller budget will require you to be even more creative and is often a bigger challenge! Look at this compact attic above, she truly is a genius at maximizing a space. During her talk it was crystal clear, lighting is her passion! Lighting can literally make or break a room. As you can see in this dining room she has included recessed lighting, a grand chandelier and sconces. This all adds to the intimacy of the space though she stresses each lighting fixture needs to have a specific purpose. 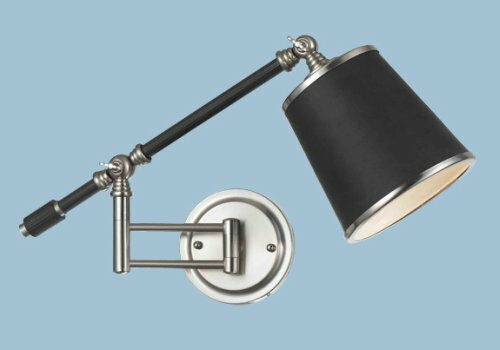 The Scope wall fixture is one of my favorites from the Candice Olson lighting collection. It could be used over a bedside table, nestled on a wall in a reading nook or even over a desk! I was lucky enough to have a few seconds to say hello in person and to thank her for continuing to inspire me! She told a story of how when she first started she received a call for a $3,000 kitchen revamp which involved her painting the kitchen cabinets on her own. Years later this same client has now hired her to design 3 houses across the country. Lesson, you never know what a small job might become! I've only admired Candice from afar. She is held very high in my esteem. She really completes a room from top to bottom and does the most amazing colour palettes that are always warm & inviting but appear to be neutral as well. You're a lucky girl to even get to hear her speak never mind have a few moments to speak:) Happy friday. What an awesome afternoon! I love Candice and her work, she is not only stunning but also so talented! Candice is an amazing designer. I love how her rooms always feel so fresh and inviting. Makes you want to stay awhile : ) You are an amzing designer yourself..easy to see her inspiration come through your creativity. I've been trying to channel Candice Olson when thinking of ways to improve my basement. She has a way with fabrics...Sometimes I think the ones she picks out will clash with each other, but they always end up looking fabulous. For me wallpaper is all about bright bold designs. But your first picture shows that you can use wall decor against a dark wall paper with self prints. That looks awesome. I admire Candice Olson too and it is easy to tell that she loves lighting. It's like jewelry for the room, don't you think? Lucky you to meet her! I like the second room.